Tile kitchen backsplash - cost, installation, styles, how long it will last. Tile is the most popular option for kitchen backsplash. There are many styles, sizes and shapes of tile to create a unique backsplash design for any kitchen. Which tile is the best for kitchen backsplash? 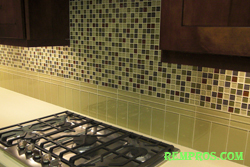 Mosaic tile backsplash is a great option. 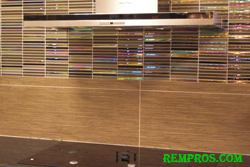 Glass mosaic available in many colors and it is a good choice for areas behind stove and sink. Glass tile is very easy to clean and it won’t lose its appearance in contact with water, steam or other element which might get on surface while cooking food on stove. Metal tile is another option you might consider for modern kitchen design. Natural stone tile is also beautiful and offer endless possibilities in styles. But any stone tile requires regular maintenance, and it is important factor to remember while shopping for a new kitchen backsplash. If the kitchen is a very busy area and you cook a lot, greasy steam from stove can damaged the surface of any unglazed or not properly sealed stone tile surface. How much does it cost to tile backsplash? The prices for getting a new tile backsplash installed will depend on which product you will use and who will perform installation. There is a very huge price range for backsplash tile. Some products might cost as low as $1 s/f and some $20 s/f plus there will be additional cost for tile adhesive and grout if necessary. 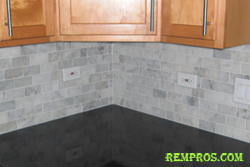 For the installation of tile backsplash and apply grout prepare to pay $10 - $20. If the work will be very complicated which include many details and (or) installation of medallions the price can be much higher. How long kitchen tile backsplash will last? 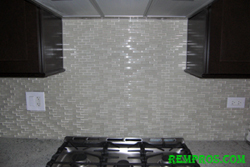 With a proper installation tile backsplash will last for many years. Tile is very long lasting product and it can easily serve its decoration function on a backsplash for 25 – 30 years or more. In majority of cases it won’t be a problem with longevity, but with appearance. 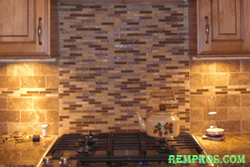 Let say in 10 – 15 years you might just want to replace old fashion backsplash with some new and modern product. 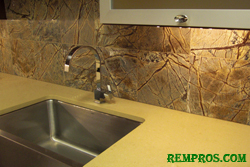 Installation of kitchen backsplash can be performed by yourself or hire a professional installer. If you are planning to do it yourself it might take longer and everything will depend on your ability to manage the installation of tile. Usually, if you hire a professional installer to tile a kitchen backsplash it shouldn’t take longer than couple of days to complete 30 – 40 s/f of backsplash area. Learn how to tile a backsplash. Is it possible to install kitchen tile backsplash in one day? It is possible, and if tile doesn’t require grout application the work might be complete in one day. Second day is usually for grouting tile backsplash which might not be possible to do right after setting tile, but let the tile adhesive dry first. Installation of tile backsplash medallions as well as very complicated work might take longer to complete. Can I use oven and sink during the tile backsplash installation? The kitchen will be fully functional during installation of tile on backsplash. Kitchen countertop should be clean without any objects because it will be on a direct way to reach the backsplash area. Electric and phone outlets as well as switches need to be readjusted, and during the installation they have to be unscrewed with a power off. They do not have to be removed – just lose, and screw it back after tile will be installed.